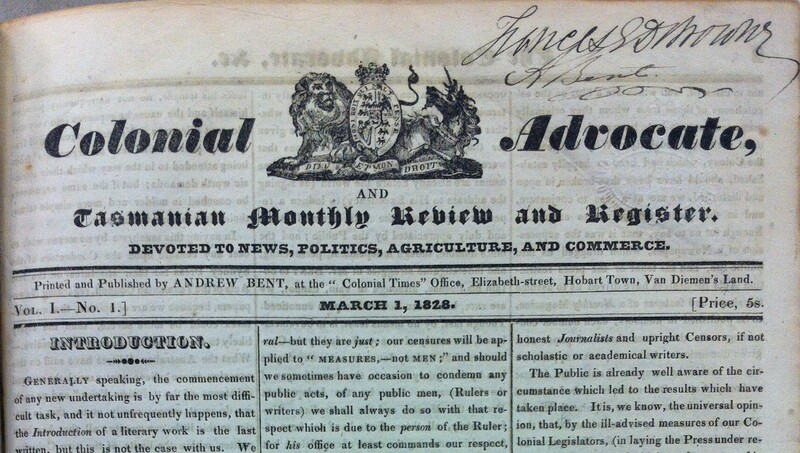 Colonial Advocate, and Tasmanian Monthly Review and Register. Devoted to News, Politics, Agriculture and Commerce. Printed and published by Andrew Bent, at the “Colonial Times” Office, Elizabeth-street, Hobart Town, Van Diemen’s Land. 31 x 23 cm. 3 columns of print on each page. Continuous pagination, each number being 50 pages. Accompanied by Bent’s Monthly Advertiser (1 leaf, unpaged). A table of contents on a single leaf was also issued for each month. Copies: complete sets are in Allport (Lacks first few pages of March issue); ANL (includes a few annotations in Bent’s hand, is signed by both Bent and Browne and has book plate of J. R. Scott, no. 3024); BL; DL (2 copies); VSL. ML holds nos. 2-3. Digital version is available on Trove (the ANL copy) as is Bent’s Monthly Advertiser. The introduction to the first number made it clear that the magazine format was chosen to evade the acts requiring newspapers to be licenced and to pay stamp duty. Being printed on six sheets of paper it fell outside the definition of a newspaper given therein. Its political intent was also clear, the ‘present critical position of affairs [rendering] a periodical print, wherein the public sentiments may be respectfully conveyed to those at the helm of our affairs … absolutely necessary.’ The first number included the first of a series of long articles on the British constitution. Jorgen Jorgenson later claimed, correctly it would seem, that many of the articles purporting to be original writing were in fact copied from elsewhere, and Hobart readers were too ignorant to notice. Bent received editorial assistance from Francis E. D. Browne, then a convict clerk in the Survey Office. An article on bribery in the May issue got Browne into deep trouble. In July a Government order was issued, prohibiting convicts for writing for any newspaper on pain of removal to a penal settlement, although Browne was, in the end, only sent to be clerk in the police office at Great Swan Port. Jorgenson also contributed some useful articles, including one on the Van Diemen’s Land Company which was later republished separately in London. The May issue included an interesting long poem ‘The Wanderer’ said to have been written by a native of Van Diemen’s Land whose identity is still a mystery. In late September Bent was subjected to a bill in equity for printing the Colonial Times without a licence and was subsequently imprisoned for contempt of court. He spent a month in gaol, and was released only after he advised he would give up the Advocate. On 7 October, writing from the gaol, Bent begged to take ‘farewell of all his public Friends-to lay down the pen of disquisition and to close his political career for ever!’ He advised that the printing materials, paper etc. belonging to the Colonial Advocate would shortly be advertised for sale.